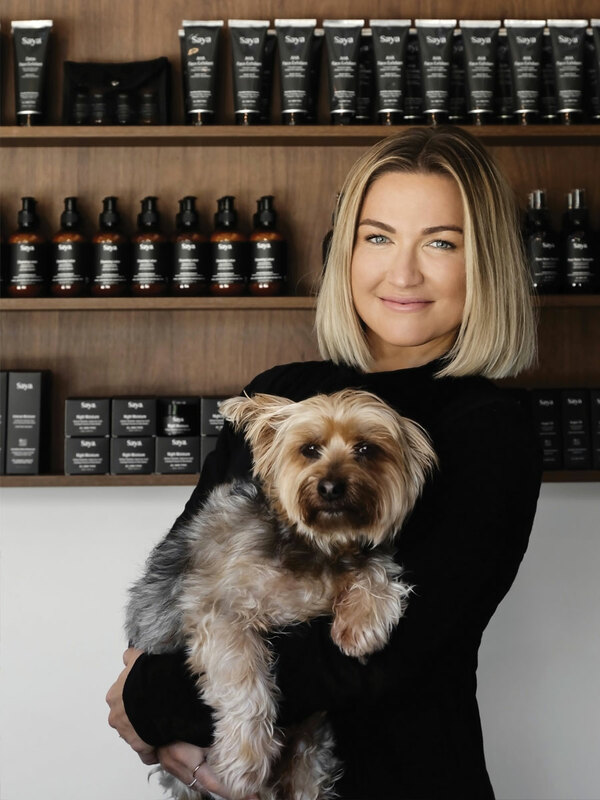 Saya McDermott has built a skincare empire right here on the Sunshine Coast. Flying planes for a living may seem an unlikely background for a cosmetic company’s founder to have, but Noosa born-and-bred Saya McDermott is skilled in the art of pleasant surprises. With previous careers as a graphic designer and a pilot, she is also the founder and owner of Saya Skincare, a range of natural products using Australian native botanicals. What sets this range apart from the plethora on the market is its emphasis on clean, purely plant-based ingredients which are organically certified, cruelty free certified, vegan friendly and uniquely Australian. Its ingredients are also certified as sustainably sourced. The company grew from a hobby Saya took up on weekends as a teenager suffering from eczema and breakouts when she was trying to find products that worked for her skin. Eventually she opened a store at the Eumundi Markets. “I actually met quite a few of my first stores that I ever supplied to at the markets,” says Saya. Today, the range is not only taking the Australian market by storm, but is making its way into the international cosmetics scene, with stockists in New York, Switzerland and New Zealand. Next on the list is the lucrative Asian market, with a recent foray into Hong Kong via the Austrade Conference the perfect opportunity to showcase the company’s unique range. Saya Skincare’s current headquarters comprise a large warehouse and retail shop located in Noosaville. Such is the growth of the business in the past two years, a local manufacturer has been contracted to make the products, so Saya and her growing team can concentrate on managing distribution, marketing and sales. This is all a long way from the humble beginnings in Saya’s mum’s kitchen, where she and her mum would mix, pack and pour the products on the weekends. Back then, her ‘day job’ was working as a graphic designer for “quite a few years”, and afterwards, following in her father’s footsteps, a pilot. Having gained both her private and commercial pilot’s licences, she flew medivac planes carrying patients needing specialised treatment from remote areas back to major cities. “I was always very hesitant to take the [skincare] business to another level – I didn’t know if I wanted to or if I knew how to, because the cosmetics industry is super competitive and cutthroat,” says Saya. “But just as I was thinking that I didn’t know what to do and thinking that I would follow an aviation career, the business started gaining momentum. Since then, she hasn’t looked back, and now loves the creative freedom she enjoys – as well as being able to catch a few waves in her spare time. With about 40 products now in the range, Saya says she is constantly adding to and tweaking it as new ingredients come on board. “We’ve got our core range and I don’t want to touch that, but we’re always evolving with new ingredients and trying to be a little bit different and diverse with what we offer,” she says. One of the range’s top sellers, according to Saya, is the detox face scrub, one of the original products she formulated. Containing peppermint and lemon, yellow clay, ground walnut shell and papaya, it sounds and smells good enough to eat. It’s not the only one – the sumptuous menu includes cleansers with marshmallow, chamomile and Kakadu plum; hand and body lotion with mandarin and patchouli; and soap with Australian green clay, lemongrass and shea butter. Extracts of native Australian botanicals such as desert lime, quandong, Illawarra flame tree and crown of gold enhance the entire range and are what Saya says “promotes luminous, soft, beautiful skin”. As an added bonus, although she didn’t set out to create vegan-friendly skincare, 99 per cent of the range is naturally vegan, making it appeal to the rapidly rising number of vegan consumers. “I think it was a no-brainer for me to only use plant-based ingredients,” says Saya. “I never considered using animal-derived products and I’m totally against animal testing; I think it’s completely unnecessary. With the global market beckoning, there’s no doubt Saya Skincare will continue its rise and rise, but Saya is adamant the brand will not leave its birthplace, Noosa – the much-loved home town of its creator – no matter how much the company may continue to expand. “Noosa’s always been home,” she says.